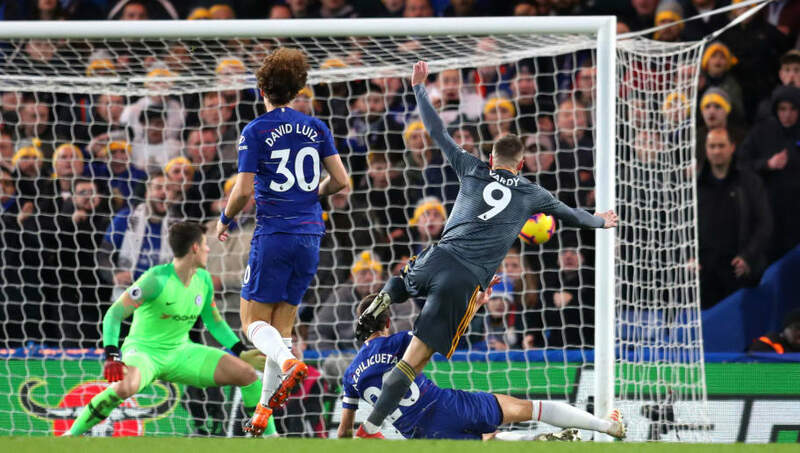 Maurizio Sarri’s reign at Chelsea suffered arguably its biggest shock to date as Claude Puel’s Leicester City claimed a stunning 0-1 win at Stamford Bridge on Saturday. 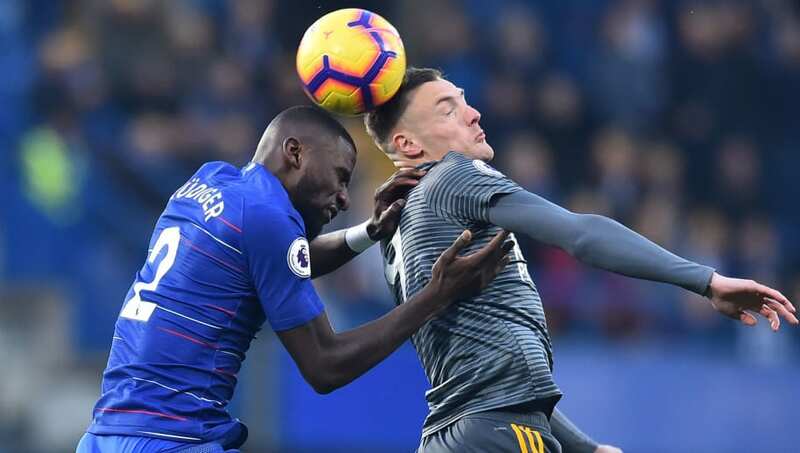 The Blues went into the match having only lost twice from their first 17 Premier League games this season but were given a harsh reminder of the work that is still to be done by Sarri and his team as a highly energised Leicester side exploited the Blues’ soft spots. Jamie Vardy hammered home the winner as the Foxes used their pace and energy in attack to great effect, with Chelsea struggling to contain the visitors on the break. The Blues were unlucky to hit the woodwork once in each half, but Leicester were ultimately deserved winners. 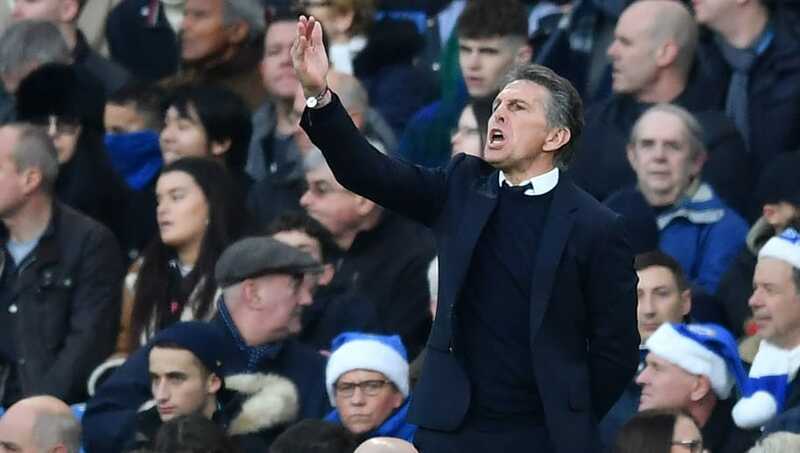 With a raft of rumours circulating prior to kick off on Saturday that Leicester were close to sacking manager Claude Puel, the Frenchman provided a defiant response at Stamford Bridge. The Foxes ditched their preferred 4-2-3-1 shape and reverted to a more compact and effective 4-3-3. The revised setup enabled the visitors greater solidarity, provided the necessary amount of bodies to compete with the hosts in the middle of the park and plenty of firepower up front. Hamza Choudhury provided an effective extra man alongside Nampalys Mendy and Wilfred Ndidi to crowd Chelsea out in central areas and limit the influence of Jorginho and co, whilst Vardy set the tone with an energised display in attack. Puel got his approach spot on. 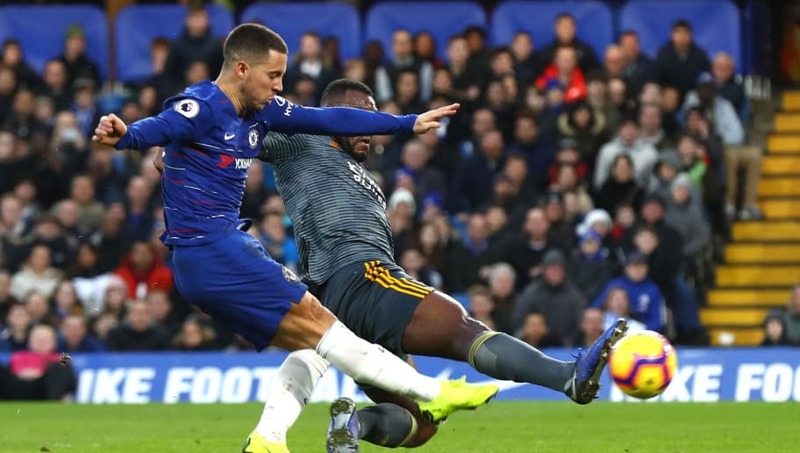 With Sarri opting once more to field star attacker Eden Hazard in a false nine role as the centrepiece of Chelsea’s front three, the Belgian once again struggled to produce his best work on Saturday. Despite seeing a fair amount of the ball and working hard to create openings going forward, Hazard generally struggled to find fluidity and the necessary support to thrive on in attack. The forward generally looks at his best cutting inside from the left flank and playing off a more physical centre forward, but lacked any such profitable link-up play against Leicester. Hazard often found himself drifting out onto the left hand side and into his preferred territory, but without a natural striker offering support through the middle, the Belgian’s drifting often left Chelsea devoid of any attacking threat through the middle. Chelsea must find their next Didier Drogba in order to rediscover their cutting edge in attack. Having been critical of Claude Puel’s tactics and with a tally of just five Premier League goals this season ahead of Saturday’s game, Jamie Vardy proved that he is still a top striker with an electric display at Stamford Bridge. With only James Maddison and Marc Albrighton offering attacking support from wide areas, Vardy needed to put a big shift in against Chelsea for Leicester to have any chance of pulling off an unlikely result in west London, and the Englishman delivered. Vardy worked tirelessly, running across Leicester’s front line to make life difficult for Chelsea’s defence on his own at times. It was his energy and efficiency that proved decisive in snatching a famous win for the Foxes, as Vardy proved to be a big-game player once more. With Vardy pulling Chelsea’s defenders left, right and centre at times, Saturday’s game provided another reminder that Sarri’s side struggle at the back when the tide is against them. Antonio Rudiger, David Luiz and Marcos Alonso all appear to thrive at playing out from the back and remaining composed with the ball, but it is when the opposition press the Blues’ rear-guard that Chelsea struggle. Vardy’s pace and tireless energy was the perfect tool for Leicester to exploit the home side’s defensive shortcomings, as only Cesar Azpilicueta looked up to the challenge in shackling Leicester’s attacks. Chelsea are clearly well drilled in possession, but have much work to do in strengthening their discipline and resolve when the run of play is against them.